We make all of our own organic fertilizers, sometimes with recipes that are thousands of years' old. Every year we aim to produce at least 1,200 metric tons of compost with which to fertilize the trees. Our stable has a small herd of Zebu cows (IndiaÂ´s holy cows) which produce the manure we need. Composting involves a lot of chipping and shredding to accelerate decomposition. Pipe systems allow airflow through the compost, which also helps. When we make silage for the cows, we produce Bokashi fertilizer at the same time, since silage and Boksahi are both fermentation processes. To spread efficient micro-orgamisms (EM's) we produce Ghana-Jivambritham or pooballs, used when planting our trees. Jivambritham is a liquid fertilizer used to spread EM's at night. Mulch is used to protect tree roots and conserve soil humidity during the dry season. The objective is for natural fertilizers to result in a crop productivity that is equal to or superior to chemical fertilizers, without the environmental, soil or human health problems associated with agrochemicals. Ecoagriculture costs are higher in terms of labour, but still more cost effective than the purchase and transport over long distances of factory products. Biochar is charcoal that has been activated with compost, cow urine or the like. Traditional charcoal making releases all the greenhouse gases or GHG's into the atmosphere. Our apporoach is to use pyrolysis ovens or retorts that burn those gases inside the retort so that there are no emissions and very little fuel required to make the charcoal. Traditional systems produce 100 KG of charcoal for every ton of biomass, whereas pyrolysis ovens produce 350 to 450 KG of charcoal for every ton of biomass, making them very efficient and environmentally friendly. Biochar acts as a retention agent in the soil, holding the organic material (compost or bokashi) with a greatly improved cation exchange capacity, an important issue in poor tropical soils. Our biochar or pyrolysis plant can produce up to 5 tons of biochar per day using branches from pruning or other material from culls. For example, one hectare of Acacia mangium when pruned leaves behind some 6 metric tons of biomass, ideal for biochar making. 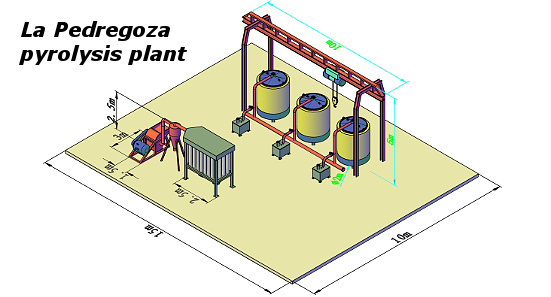 The pyrolysis ovens allow for controlled temperatures, as certain temperatures produce better retention capacity in the biochar than other temperatures. In forestry the objective is to apply 10 metric tons of biochar per hectare (1 KG per square meter) in poor tropical soils. Once applied to the soil, biochar has a half-life of 1,000 years, making it a phenomenal soil nutrient and organic material retention agent. Why don't we use agrochemicals?? Vichada has a fragile environment with a vast drainage system and very porous soils. Agrochemicals can easily wash into our rivers, caños and morichals causing contamination. Herbicides kill bees needed for pollinization. Agrochemicals compact and asphyxiate the soil, killing micofauna and leaving dead soil behind. Trees fertilized with agrochemicals are less resistant to diseases or plagues. Ecoagriculture are landscapes with environmentally friendly agricultural practices that allow for agricultural or forestry production while conserving biodiversity and enabling local communities to live in harmony with their natural surroundings. Clean agriculture is part of that, avoiding practices and materials that may cause contamination or other environmental problems.